For the Gordon Burn novel, see Alma Cogan (novel). 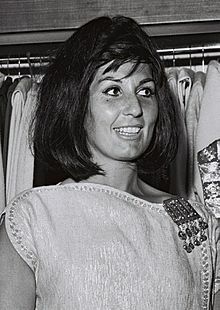 Alma Angela Cohen (19 May 1932 – 26 October 1966), known professionally as Alma Cogan, was an English singer of traditional pop music in the 1950s and early 1960s. Dubbed the "Girl with the Giggle in Her Voice", she was the highest paid British female entertainer of her era. She was born on 19 May 1932 in Whitechapel, London, of Russian-Romanian Jewish descent. Her father's family, the Kogins, arrived in Britain from Russia, while her mother's family were refugees from Romania. Cogan's parents, Mark and Fay Cohen, had another daughter, the actress Sandra Caron, who went on to play "Mumsey" in The Crystal Maze, and one son, Ivor Cogan. Mark's work as a haberdasher entailed frequent moves. One of Cogan's early homes was over his shop in Worthing, Sussex. Although Jewish, she attended St Joseph's Convent School in Reading. Her father was a singer, but it was Cogan's mother who had showbusiness aspirations for both her daughters (she had named Cogan after silent screen star Alma Taylor). Cogan first performed in public at a charity show at the Palace Theatre in Reading, and at the age of eleven, competed in the "Sussex Queen of Song" contest held at a Brighton hotel, winning a prize of £5. Aged 14, she was recommended by Vera Lynn for a variety show at the Grand Theatre in Brighton. At 16 she was told by bandleader Ted Heath "You've got a good voice, but you're far too young for this business. Come back in five years' time." Heath would later say: "'Letting her go was one of the biggest mistakes of my life." But Cogan found work singing at tea dances, while also studying dress design at Worthing Art College, and was soon appearing in the musical High Button Shoes and a revue, Sauce Tartare. She became resident singer at the Cumberland Hotel in 1949, where she was spotted by Walter Ridley of HMV, who became her coach. Cogan's first release was "To Be Worthy of You" / "Would You", recorded on her 20th birthday. This led to her appearing regularly on the BBC's radio show Gently Bentley, and then becoming the vocalist for Take It From Here, a British radio comedy programme broadcast by the BBC between 1948 and 1960. Many of her recordings were covers of U.S. hits, especially those recorded by Rosemary Clooney, Teresa Brewer, Georgia Gibbs, Joni James and Dinah Shore. Her voice was often compared with Doris Day's. One of these covers, "Bell Bottom Blues", became her first hit, reaching no. 4 on 3 April 1954. Cogan would appear in the UK Singles Chart eighteen times in the 1950s, with "Dreamboat" reaching no. 1. Other hits from this period include "I Can't Tell a Waltz from a Tango", "Why Do Fools Fall in Love", "Sugartime" and "The Story of My Life". Cogan's first album, I Love to Sing, was released in 1958. Cogan was one of the first UK record artists to appear frequently on television, where her powerful voice could be showcased along with her bubbly personality and dramatic costumes. Her hooped skirts with sequins and figure-hugging tops were reputedly designed by herself and never worn twice. Cliff Richard recalls: "My first impression of her was definitely frocks – I kept thinking, how many can this woman have? Almost every song had a different costume. The skirts seemed to be so wide – I don't know where they hung them up!" Cogan topped the annual NME reader's poll as "Outstanding British Female Singer" four times between 1956 and 1960. The UK musical revolution of the 1960s, symbolised by the rise of the Beatles, suddenly made Cogan unfashionable; in the 1991 BBC documentary Alma Cogan: The Girl with the Giggle in Her Voice, Lionel Blair said she was perceived as "square". Her highest 1960s chart ranking in the UK was no. 26 with "We Got Love", and most of her successes at this time were abroad, notably in Sweden and Japan. She was especially disappointed that her 1963 cover of the Exciters' US hit "Tell Him" did not return her to the UK charts, according to singer Eddie Grassham. In 1964, Cogan recorded "Tennessee Waltz" in a rock-and-roll ballad style; this version was no. 1 in Sweden for five weeks and also reached the top 20 in Denmark, while a German language rendering reached no. 10 in Germany. She had another number one hit in Sweden in 1965, "The Birds and the Bees". Cogan also wrote some of her own songs. She co-wrote her 1963 record "Just Once More" (under the pseudonym of "Al Western") with her long-time pianist Stan Foster; her 1964 record "It's You" was also a Cogan-Foster collaboration, although this time she was credited under her own name. "Just Once More" peaked at no. 10 in the Swedish Voting Chart "Tio i Topp" in October 1963. She continued to be a popular figure on the UK showbusiness scene, being offered the part of Nancy in Oliver!, appearing on the teenage hit-show Ready Steady Go!, and headlining at the Talk of the Town. Cogan lived with her widowed mother in Kensington High Street (at 44 Stafford Court) in a lavishly decorated ground-floor flat where she frequently entertained other celebrities. Regular visitors included Princess Margaret, Noël Coward, Cary Grant, Audrey Hepburn, Michael Caine, Frankie Vaughan, Bruce Forsyth and Roger Moore. John thought I didn’t know anything about him and Alma, and I never let on. Now that I think about it, with all the emotion gone out of it, I can see the attraction. Alma was about eight years older than John and very much the Auntie figure. Don’t forget that Yoko was also older than John by about seven years. Like Yoko in so many ways, Alma was a very compelling woman. You couldn’t really say that either of them was beautiful, could you, not in the conventional sense. When Alma died from ovarian cancer, aged only 34, John was inconsolable. Cogan was close to the other Beatles as well, especially Paul McCartney, who first played the melody of "Yesterday" on her piano; he also played tambourine on her recording of "I Knew Right Away". Her last romance was with Brian Morris, who shared her faith. They were engaged to be married. Cogan tried to update her image by recording some Beatles numbers and a spin-off from The Man from U.N.C.L.E. ("Love Ya Illya"). But by 1965 record producers were becoming dissatisfied with Cogan's work, and it was clear that her health was failing. Her friend and colleague Anne Shelton attributed this decline to some 'highly experimental' injections she took to lose weight, claiming that Cogan was never well again after that. Cogan embarked on a series of club dates in the North of England in early 1966, but collapsed after two performances and had to be treated for stomach cancer. She made her final TV appearance in August, on the guest-spot of International Cabaret. The following month she collapsed while touring Sweden to promote Hello Baby, recorded exclusively for the Swedish market. She died of ovarian cancer at London's Middlesex Hospital on 26 October, at the age of 34. In deference to family custom, her death was observed with traditional Jewish rites, with burial at Bushey Jewish Cemetery in Hertfordshire. The novel Alma Cogan by Gordon Burn presents an imaginary middle-aged Cogan looking back on life and fame in the 1980s. It claimed to be based on true events and real people, except for her early death, and won the Whitbread Book Award in 1991. Partly adapted from this novel was the BBC Radio 4 series Stage Mother, Sequinned Daughter (2002) by Annie Caulfield. Cogan's sister Sandra felt that it misrepresented both Cogan and her mother, and tried unsuccessfully to get it banned. Eventually the Broadcasting Standards Commission ruled that the BBC apologise to Sandra for failing to respect the feelings of the surviving family members. The romantic comedy In Love with Alma Cogan is a film starring Roger Lloyd-Pack. He is an aging manager of an old-fashioned Pier Theatre. It leads to a flashback to his encounter with Alma Cogan, who performed at the theatre in his youth. A blue plaque commemorating Cogan was installed by the entrance of 44 Stafford Court, her longtime residence, on 4 November 2001. 1952 – "To Be Worthy of You" / "Would You"
1952 – "Meet Me on the Corner"
1952 – "Waltz of Paree" / "Pretty Bride"
1952 – "Half as Much" (cover of Rosemary Clooney) / "Blue Tango"
1952 – "Take Me in Your Arms and Hold Me" / "Wyoming Lullaby"
1953 – "Till I Waltz Again with You" (cover of Teresa Brewer) / "Happy Valley Sweetheart"
1953 – "Till They've All Gone Home" / "Hug Me A Hug"
1953 – "If I Had a Golden Umbrella" / "Mystery Street"
1953 – "My Love, My Love" (cover of Joni James) / "Wasted Tears"
1954 – "Ricochet (Rick-O-Shay)" (cover of Teresa Brewer) / "The Moon Is Blue"
1954 – "Make Love to Me" (cover of Jo Stafford) / "Said the Little Moment"
1954 – "Little Shoemaker" (cover of The Gaylords) / "Chiqui-Chaqui (Chick-ee Chock-ee)"
1954 – "Skinnie Minnie" (cover of Teresa Brewer) / "What Am I Going To Do, Ma"
1954 – "(Don't Let The) Kiddygeddin'" / "Mrs Santa Claus"
1955 – "Paper Kisses" / "Softly Softly"
1955 – "Tweedle Dee" (cover of Lavern Baker) / "More Than Ever Now"
1955 – "Tika Tika Tok" / "Chee Chee Oo Chee"
1955 – "Where Will The Dimple Be?" (cover of Rosemary Clooney) / "Keep Me in Mind"
1955 – "Got'n Idea" / "Give A Fool A Chance"
1955 – "Hernando's Hideaway" (one of many covers) / "Blue Again"
1956 – "Love and Marriage" (cover of Frank Sinatra) / "Sycamore Tree"
1956 – "Don't Ring-A Da Bell" / "Bluebell"
1956 – "Mama, Teach Me to Dance" / "I'm in Love Again"
1957 – "Chantez, Chantez" (cover of Dinah Shore) / "Funny Funny Funny"
1957 – "That's Happiness" / "What You've Done To Me"
1957 – "Party Time" / "Please Mister Brown"
1958 – "Stairway of Love" (cover of Michael Holliday) / "Comes Love"
1958 – "Sorry Sorry Sorry" / "Fly Away Lovers"
1958 – "There's Never Been a Night" / "If This Isn't Love"
1959 – "Pink Shoelaces" (cover of Dodie Stevens) / "The Universe"
1960 – "Just Couldn't Resist Her With Her Pocket Transistor" / "Must Be Santa"
1961 – "With You in Mind" / "Ja-Da"
1961 – "All Alone" / "Keep Me in Your Heart"
1961 – "She's Got You" (cover of Patsy Cline) / "In the Shade of the Old Apple Tree"
1962 – "Goodbye Joe" (cover of Harald Juhnke's German hit "Der schwarze Joe aus Idaho") / "I Can't Give You Anything but Love, Baby"
1963 – "Tell Him" (cover of The Exciters) / "Fly Me to the Moon"
1963 – "Hold Out Your Hand You Naughty Boy" / "Just Once More"
1964 – "Tennessee Waltz" (cover of Patti Page) / "I Love You Too Much"
1964 – "It's You" / "I Knew Right Away"
1965 – "Snakes And Snails" / "How Many Nights, How Many Days"
1965 – "Love Is A Word" / "Now That I've Found You"
1966 – "Now That I've Found You" / "More"
^ "Dead Rock Stars Club @ efortress.com". Users.efortress.com. Archived from the original on 28 September 2007. Retrieved 30 December 2011. ^ Mantel, Hilary (24 September 1992). "On the Edge". The New York Review of Books. Retrieved 14 March 2011. ^ The "Tail Pieces by the Alley Cat" column in NME dated 14 September 1956 cites Sandra Caron's age as 19. ^ "The Crystal Maze gives us out first look at Maureen Lipman as Mumsey". Metro. ^ "Alma Cogan". mp3.com. Retrieved 26 November 2007. ^ "Audrey.hepburn.free.fr". Audrey.hepburn.free.fr. Retrieved 30 December 2011. ^ "Alma Cogan – Biography". Archived from the original on 28 February 2008. Retrieved 12 February 2008. ^ "Chartstats.com". Chartstats.com. 27 March 1954. Retrieved 30 December 2011. ^ Vandyke, Alan. "Lastingtribute.co.uk". Lastingtribute.co.uk. Archived from the original on 6 January 2010. Retrieved 30 December 2011. ^ a b c "Alma Cogan biography". AllMusic. Retrieved 23 May 2009. ^ Rice, Jo (1982). The Guinness Book of 500 Number One Hits (1st ed.). Enfield, Middlesex: Guinness Superlatives Ltd. p. 20. ISBN 0-85112-250-7. ^ "Sentstarr.tripod.com". Sentstarr.tripod.com. Retrieved 30 December 2011. ^ "Alma Cogan" in findagrave.com. Retrieved November 11, 2017. ^ "Telegraph.co.uk". Telegraph.co.uk. 4 December 2003. Retrieved 4 October 2014. ^ "Alma Cogan Competition". Almacogan.com. 17 May 2009. Retrieved 5 April 2015.